I am a big fan of pancakes. Savoury, sweet…it doesn’t bother me, in fact one of each is just about perfect! In university, we used to have big pancake parties, I must have made about 100 pancakes – not all for me I must add! It was great fun though, and I have some lovely memories of pancake days! I’ve adapted a pancake style mix to make these bilinis. I’ve added oats for a little texture and to promote a feeling of fullness. I make these bilinis so they’re on standby for snacks, canapes or starters, and you could incorporate them into a dessert too. They’re great sweet or savoury. Plus they’re so cute!! 1. Mix together egg and milk/milk and water. 2. Add oats and flour and mix well. The mixture will be quite runny. 3. Heat frying pan and add a little oil (I used spray oil, or you can use kitchen paper to grease it with a little margarine/cooking oil). 4. Using a ladle, pour the mix into the hot pan ensuring whole pan is covered. 5. Cook on a low-medium heat for 3-5 minutes, until the pancake is solid enough to turn over (I use a spatula for this as it’s not as ‘flippable’ as a normal pancake). 6. Cook for 2-3 minutes on the other side. 7. Remove from pan, let cool. 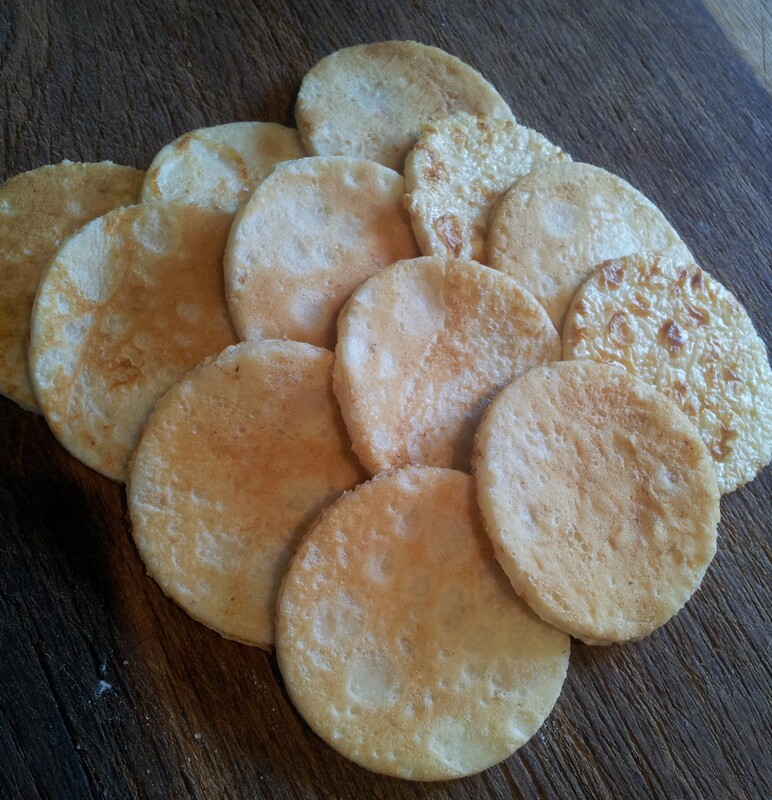 Then, using a circular shaped cutter, cut out the bilinis from the pancake. This mix should make around 3 pancakes, each making around 8 bilinis. Nutrition info below is per bilini without topping. They’ll store in an airtight container in the fridge for a few days. Perfect for when you’re peckish! Top with some cream cheese, cucumber and salmon or some peanut butter if you’re fancying sweet. Remember a snack is only a snack if it’s less than 100kcal, so keep it to 2 or 3!